…should you choose to accept it! Two sock monkeys, his and hers… by Thursday!!! I have a really good friend, I love her dearly… but seriously! She obviously doesn't read my blog (thanks for your support!) because she has only just stumbled upon the sock monkey post which was from way back in the summer, and in doing so expects me to drop everything and magic up two in as many days as an anniversary present!!! 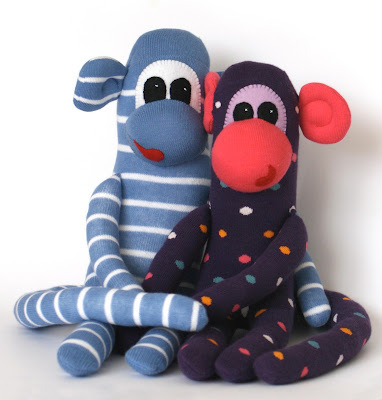 …so my two little sock monkeys have fallen in love! Can you feel the lurve in the room! She is such a monkey to photograph, because she is a lovely purple colour but unfortunately I only had ten minutes to take the shots before an afternoon in school so they are not as perfect as I would have liked. I still love them and I hope they are much loved. …I also made a pink stripy girl (which is why I only had ten minutes to photograph), just need to sew on her ears tomorrow over a cup of coffee… photos to follow. Anybody else making sock monkeys? Yes I take on challenges like that. Love the monkeys. Funnily enough I do have a number cut up ready to sew - I might get to them next week as I'm not working over half term. Just a pair of socks! On a roll with the Rainbow!